Are you planning to start a business raising rabbits for commercial use? Then, our guide can help you learn the basics of starting a rabbit farm right out of your backyard. Here you will find rabbitry facilities and equipment needs, rabbit breeding guide, and miscellaneous tips about running a rabbit farm. Rabbit farming requires modest investment as it needs only simple facilities and small land area. A small rabbit farm could have 15 to 100 rabbits requiring between $5,000 and $10,000 in startup capital. For a meat producing rabbitry selling premium priced rabbit meat, an ROI of 45% during the first year of operation is possible. To start your rabbit farm, prepare a rabbit hutch that is well lit and well ventilated with heating and cooling systems. Metal cages are usually recommended for its ease of cleaning. Equip the cages with feed hopper, watering system, and nest box. Rabbits are used for their wool, fur, and meat. They are also used as testing specimens by laboratories. Their breeds usually determine how they are used. And so, before starting a rabbit farm, it is important that a prospective rabbit breeder determines to whom he should sell his rabbits. Will it be to restaurants, meat shops, individual purchasers, schools, laboratories, hospitals or breeders? One can advertise his business in rabbit journals, rabbit association directories and farm periodicals and by joining rabbit exhibits. 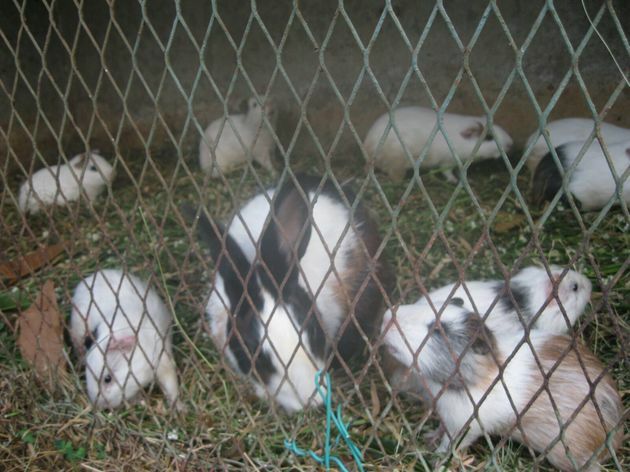 Breeding stock for a rabbit farm may be bought from local breeders. Medium-sized rabbits breed at 6 to 7 months of age and give birth after a month of gestation. Female rabbits can produce up to 50 live rabbits annually, with births high during the summer. They produce an average of 9 kits per birth. Check with your local office about regulations that you must comply with in relation to rabbit farming. For resources on rabbit breeding, visit American Rabbit Breeders Associations. Kapenta fish farming is a commercial livelihood that requires good research and ideas to be able to prosper in this business venture. If you are looking for the best business to venture into, starting a white pig farm is your best choice. As long as you properly manage your pig farm, expect that you can reach the maximum profit you want to obtain. We have a poultry farm in which alongside we have done rabbit farming.My query is that is rabbit farming compatible with poultry farming? i am interested to open a rabbit farm and i have only 20 rabbits. how i can form a big farm with my rabbits. I am interested in starting a rabbit farming business. I have the land to start out, but my major concern is the climate. I appreciate if you could help me with information. heat during the day of summer is high and down freezes a month or two in the winter. Thank you! I am interested in starting a rabbit farming business. i have a land to start the project. i will be grateful if you could give more information and also buyer and seller contact with name and address. sir, i am thinking about starting a rabbit farm on a low budget. i want full information for how to start and manage a farm. please give your all advice and guides to me. In Kenya, we are still struggling with rabbit farming. Our NGO plans to assist farmers to embark on this farming. However, we are unsure of the market dynamics. I would like to purchase 2 Altex Bucks and 4 purebred New Zealand White ones for meat production. However I live in Trinidad and would like to make contact with someone who can ship the above to me. Contact me at andrew_gokool@yahoo.com. I am interested with rabbit farming. My only worry is that i don't know whether there is market for rabbits or its product in Kenya or elsewhere. Also how do i get the good rabbit breeds. Lastly where do i get more information on rabbit keeping in Kenya. I am based in central kenya. Please assist. I need to start a rabbit firm. I plan to start initially in small scale and further i plan to establish it in large scale. so kindly provide information about establishing the firm. i would be very grateful if you could provide me with the following information about rabbit farming. please: example of good hygiene cages, type of breed for meat & wool, conditions, environment, equipment, basic information on how to farm intelligently. Thank you very much! dear sir, my name is vairamuthu from tamilnadu, India. now i want improve my rabbit farm. please give me some details about the firm. what is the market value in tamilnadu(India)? and also i want export details. sir i am an unemployed educated youth i was thinking of starting something of my own. i want to enter into rabbit farming plz suggest me the measures. Dear sir/madam, I have 3 acres of land right in the suburbs of Dar es Salaam. I already have 20 rabbits. I would like to get more information on markets within and outside the region. respected sir/mam, actually i have some land and some small capital too.. i'm very much interested in rabbit farming, i live near bangalore, karnataka. plz do need full.. I am interested in rabbit farming and would request for more information on disease management, nutrition, and housing. I am in Central Kenya Thanks. Hi Sir, i am jagdeesh from kerala. I want to do rabbit farming. i want to know to whom i should consult for farming. (1)how much expenditure is required for starting rabbit farming? am from kenya and i have started rearing rabbits. The challenge we have is insufficient funds to construct a rabbitry which will help us tap the urine for organic farming. Do you assist entrepreneurs who are stuck by capacity building them and financial assistance? I am in nairobi, Kenya. i would like to start rabbit farming for business. where do i get info on the market, both local and international? I am from Malaysia. I am planning a Duck farm in Siem Reap Cambodia, as part of a poverty reduction livelihood project for a few villagers. Can RABBITRY be considered side by side with the ducks? Or will it pose a health hazard? What can I do to initiate this Rabbit farm ( small scale) to help supply meat to the poor? ( they eat rats, snakes, red ants in the interior cos of poverty) Thank you. 1. I have understood that a kit can be weaned at 4 weeks old, is there any supplements that it may need if it is to be weened at that age? some say that weaning takes a total of 8 weeks. one litter, I have now, are from a litter of 12, the mother separated 4 out, and has 8 she is tending to. Eyes opened right at 2 weeks. I know their digestive system may not be ready, so was wondering if there is any dietary supplement that can be used to help them along. please give me details of Rabbit meat market. My Address mentioned below... Suvajit Roy, Vill-Daharthuba, P.O-Hatthuba, Dist-North 24 parganas, Pin code-743269, West Bengal. I AM FROM INDIA ( MUMBAI ) MAHARASHTRA STATE, WE HAVE 20 ACRES OF LAND AT RATNAGIRI DISTRICT AND INTERESTED TO START CHICKEN POULTRY FARM AS WELL AS RABBIT FARMING, PLEASE GUIDE ME IS THIS WILL BE A WISE DECISION TO DO BOTH AS MENTIONED AND A SCOPE IN INTERNATIONAL MARKET FOR AN EXPORT BUSINESS. We have a rabbit farm just outside Nairobi kenya. We can share more ideas with those in Kenya wishing to go into rabbit farming. We wish to through this venture to help in poverty alleviation, engage the jobless, participate in rabbit research and development and to add to the societies food chain. Contact us to share ideas. hi, my name is sharafudeen. i want to start a rabbit farm in india (kerala state), please give me the all information about rabbit buyers and sellers. thank you. thanks for this opportunity to ask some very important questions about rabbits. 1. which types(i mean breeds) of rabbit are there? 2. some people say the white breeds are more marketable than coloured ones, especially black ones? What is the life span of a typical doe or buck? I am planning to start a rabbit farm in ghana and need these preliminary information, please. thanks for your time and answers to the questions. i am planning to buy a plot at nakuru-kenya and start rabbit farming but concerned about the market. kindly give me more details on the various breeds and the market. am in nyandarua district, kanyagia location, muruai sublocation in kenya and having a rabbit farm, and expecting to expand it, how can i get a reliable market. am having pure breeds and well feed, and good breeding records. I'm interested in rabbit farming and I've got land for the same please give me information about the rabbit supplier, seller and the buyer of the meat and the minimum requirement of investment an land to start farming. Thanx. I' m interested in starting a rabbit farm but I need all info possible to make this happen. If you would help me I would really appreciate it. I am based in Kenya. I want to throw myself into rabbit rearing business starting this year. I already know that there is money in this. Irene Kamau, get in touch. 0722-977522. I own five acres of land in Rongai area of Nakuru, kenya and wish to start a rabbit rearing venture. how do i go about it? Am a student from plateau state polytechnic, to be precise from jos city, plateau state, nigeria. am interested in starting rabbit farming, please i need more info about their feeding, housing, e.t.c. i want to start rabbit farming. i m from LUCKNOW, UTTAR PRADESH, INDIA. i would like to know the potential market to sell rabbits meat n its skin n its selling price ? how to start a rabbit farm in my place? Am a new comer in this rabbit business. Could you please quote for the selling price of mature rabbits hear in Kenya and worldwide. Thank you. Dear Friends, I want to start Rabbit farming on the small basis. Is this business profitable and who purchase Rabbits from us. I Need a guidance for Rabbit farming. If any one have Knowledge of Rabbit Farming Please Feel free to call me. My Number is (0)9913484859. I am in Ahmedabad, Gujarat. I am based in Kenya in a town called Nakuru. I would like to have information regarding the rabbit farming business and the building of the needed structures. I would also appreciate if you would give me tips on how to maximize space on a one acre piece of land. i am a kenyan with enough space and from an area where people would be interested in commercial rabbit keeping my only worry is market for the same and also probably having an upto date slaughter house in the neighborhood to ensure that we give the best meet as far as the region is concerned. pls advice. thank you. I'm youth in kenya Nairobi i have the land to do the farming kindly advice me on the best breeds for meat and the market thanks.